I purchased Cheerful Weather for the Wedding while out with other bloggers and book-tubers when we visited the lovely Persephone shop on Lamb’s Conduit Street in London, and it is the first Persephone I have ever actually read, despite having admired their books for some time. I would encourage a visit to the shop if you love 20th century fiction and hidden gems – the shop is a hidden gem and so are its books, as Persephone’s remit is to publish forgotten or lesser known books from the 20th century, all in their elegant grey covers. The bestselling titles are given the honour of becoming Persephone Classics and are republished with beautiful illustrated covers. My first Persephone was one of these, and very attractive too. The book is a sweet little novella that takes place on the wedding day of a young woman torn between old love and new. It is at once a comedy of manners, a satire of the middle classes, and a desperate story of lost love. And all this in under 200 pages. It’s not exactly groundbreaking, but it is enjoyable and interesting, with great flashes of humour and wit as well as sharp observation and unsentimental emotion. I read it in two days, on holiday in France, and it was the perfect thing to read at the time. Light but not fluffy; complex but not complicated. It is quite ‘of the time’ and in keeping with a lot of the Bloomsbury set’s work, I think. Like a simpler version of Mrs Dalloway it is a ‘day in the life’ that manages to expand over time and space and incorporate so much more than the events that it relates, and I really loved this about it. You learn snippets of background information here and there, mostly through conversation, and this felt very natural and free-flowing. 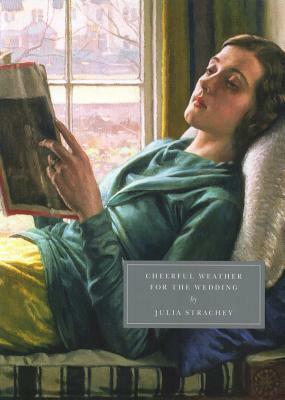 Julia Strachey also seems like quite an interesting character, and I very much enjoyed reading about her in the introduction written by Frances Partridge (who knew her in real life). It has sort of renewed by interest in the era – I say sort of because I know I’m not about to go on a Bloomsbury set spree – and I will definitely read some more Persephones. On the same day I bought Good Evening, Mrs Craven: The Wartime Stories of Mollie Panter-Downes, which I am really looking forward to. Originally published in 1932 by the Hogarth Press; reprinted by Persephone Books in 2002 and as a Persephone Classic in 2009.